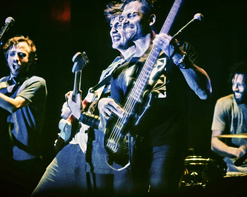 Looking to round out their live shows, Hertzog and Kaneff turned to Broadway where they found vocalist Daniel Jackson, aka Djax, who was just finishing his role in the international production of “American Idiot.” Next they hired drummer Cinque Ubangi Kemp – and The Young Presidents became a fully realized rock band! The band’s newest album release, the eclectic “FIREHORSE,” is unique for it’s style: side A on the album is the “electric” side, recorded and mixed at Room 17 Studios, and side B is the “acoustic” side, recorded at MKM Studios and mixed at Rubber Tracks (2 more songs were added as bonus tracks for the digital and CD releases). Their first offering from the album is the single “Loner,” its sound perfectly suited to both the rock and the acoustic. The band kept it in-house for the “Loner” video, giving Djax the opportunity to flex his directing skills. As the band performs in an empty club, a narrative plays out of a young dancer and the grueling, often abusive, training regimen she is subjected to. No matter how hard she works, her instructor seeks complete control over her every move. In search of a more supportive environment, she wanders into the legendary Cutting Room in New York City to find The Young Presidents. Their sound is everything she needs to feel free and she dances with abandon and joy – even if for a fleeting moment. We’re incredibly excited to be working with The Young Presidents once again, and are confident that you will jump at the chance to include the video in your programming. Please contact Andy Gesner and the HIP Video Promo staff at (732)-613-1779 or email at info@HIPVideoPromo.com. You can also visit www.TheYoungPresidents.com for more info on The Young Presidents.